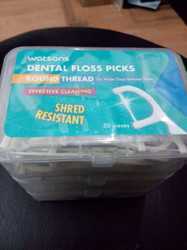 We offer Tooth Whitening Products such as dental floss and pearl drops. 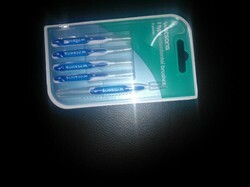 It keeps the teeth clean with good. 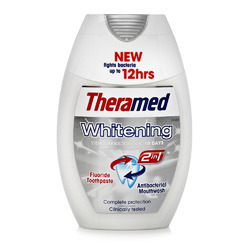 Theramed 2in1 Toothpaste & Mouthwash Whitening Theramed 2in1 Toothpaste & Antibacterial Mouthwash Whitening For visible results in just 10 days without damaging the enamel. . Long-lasting complete protection against;. Cavities. Tartar. Discolorations. Plaque and Halitosis. Gum problems Directions; Brush at least twice a day.Children of 6 years and younger; Use a pea sized amount for supervised brushing to minimize swallowing.In case of intake of Fluoride from other sources consult a Doctor or Dentist. Ingredients; Aqua. Sorbitol. Hydrated Silica. Alcohol. Sodium Lauryl Sulfate. Alumina. Disodium Azacycloheptane Diphosphonate. PEG-32. Aroma. Xanthan Gum. PEG-30. Glyceryl Stearate. Sodium Fluoride. Disodium Phosphate. Sodium Saccharin. Cocamidopropyl Betaine. Zinc Sulfate. Sodium Chloride. Sodium Sulfate. Sodium Benzoate. Limoene. Cl 77891. Contains Sodium Fluoride (1450ppm F). 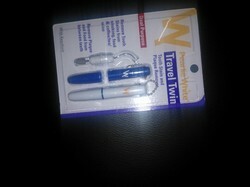 Pearlie White Travel Twin - Tooth Stain & Plaque Remover offered helps in supporting removal of tooth Stains gained from smoking, food and coffee/tea/_wine. Being easy and more convenient to use, the product also supports removal of plaque and food present between teeth. Further, it also effectively removes plaque that helps in preventing surface stains between teeth which at later stages changes to tartar that can accumulate as a hardened layer on teeth and underneath gum line where it can irritate gum tissues. Watsons Oral Care range is specially designed for families who want safe yet effective oral care for healthy teeth and the freshed possible breadth. 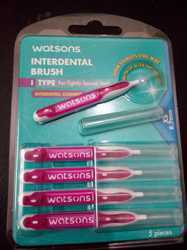 Watsons I Type interdential brushes have been developed to remove plaque from the space between your teeth which a toothbrush cannot reach. Looking for Tooth Whitening Products ?